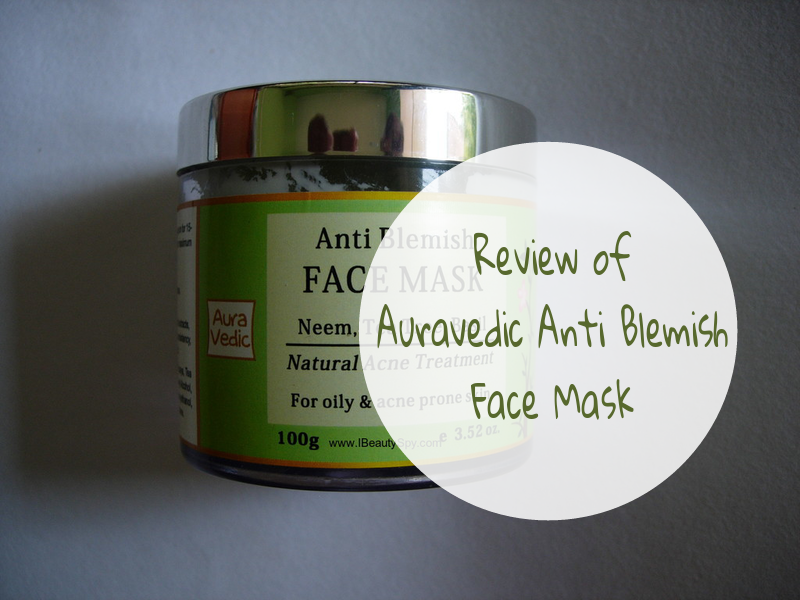 Today’s review is of a natural face pack for acne-prone skin – Auravedic Anti Blemish Face Mask. I have reviewed some of Auravedic products here. What I like about them is that their products are affordable as well as effective and free from parabens, paraffin and harmful chemicals. I was particularly attracted to this face mask as I have lot of acne scars and blemishes that am trying to fade. 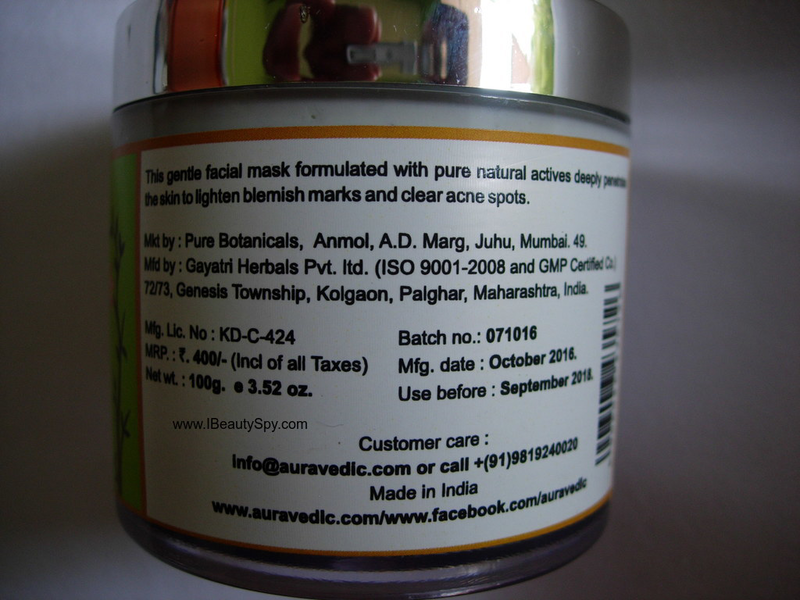 Read on to know how Auravedic Anti Blemish Face Mask fared on my scars and blemishes. This gentle facial mask formulated with pure natural actives deeply penetrates the skin to lighten blemish marks and clear acne spots. Extracts of neem, tulsi, turmeric, aloevera, papaya, tea tree oil, jojoba oil, coconut oil, kaolin, stearic acid, cetostearyl alcohol, glycerine, triethanolamine, fragrance, purified water, phenoxyethanol, ethylhexyl glycerine, potassium sorbate, butylated hydroxy toluene. Rs.400 for 100g and Rs.200 for 50g. The product comes in a classy tub packaging with a inner lid for protection. It comes in two sizes – 100g and 50g. So if you wish to try the product before buying a bigger size, you can go for the smaller one. 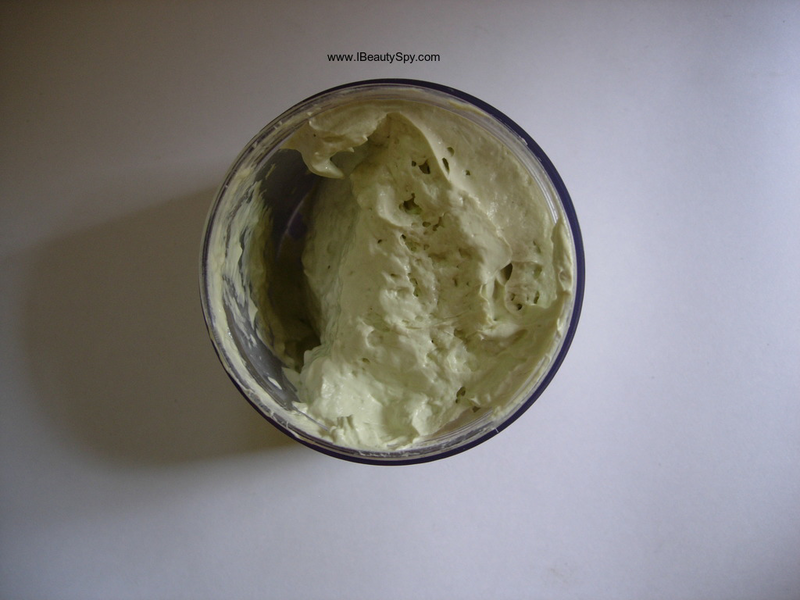 Auravedic Anti Blemish Face Mask is light green in color and has a thick, paste-like consistency. It has a mild ayurvedic smell which is very soothing to the senses. The face pack spreads evenly on the face. I like to spritz some rose water on my face before applying as its easier to spread it on a damp skin. The first thing that I notice on applying is that it doesn’t sting or cause a burning sensation unlike other face packs. It actually feels very soothing on the face. The face pack gets dried in about 15 minutes. After washing my face with water, I can feel my skin is clean and bright. I can feel my pores have been minimized. It doesn’t cause any dryness or stretchy feeling. With regular use, I can see my acne scars and blemishes have faded considerably. The acne scars on my left cheek have faded almost 80% while those on my right cheek which are older and more stubborn have faded by 50%. Which is a big relief for me as old and stubborn scars are difficult to remove. I think if I use another tub of this Auravedic Anti Blemish Face Mask, they might be faded completely. Also, I have been using this Auravedic Anti-Blemish Face Mask as an on-spot treatment whenever I get a new breakout or pimple. I have found that it helps to calm down the inflammation and reduce the size. If I apply it daily, the breakout vanishes without leaving any scars. The instructions mention to use it daily. And I feel for best results it needs to be used daily as its an ayurvedic formulation and needs consistent use to show results. Its very gentle and not harsh on the skin. So it is perfect for everyday use. If you suffer from acne-prone skin, I would definitely recommend you to add this in your shopping cart next time. 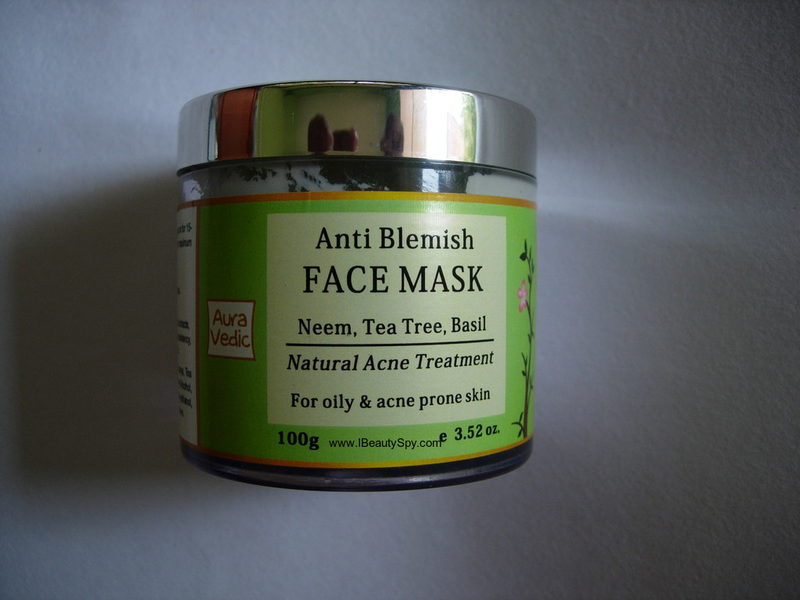 Its one of the affordable and effective face masks for acne. The face pack contains neem, tulsi, turmeric, tea tree oil and aloe vera, all natural ingredients, which are beneficial for acne treatment. * Nice consistency for easy application. * Soothes and calms down inflammation. * Diminishes the size of active breakouts. * With regular use, fades blemishes and acne scars. * Gives clear and bright skin. * Impressive ingredients list containing neem, tulsi, turmeric, tea tree oil, etc. Yes, for acne-prone skin. Or if you have blemishes and acne scars and wish to fade them. Yes, it’s one of the most affordable and paraben-free face mask available. Auravedic Anti Blemish Face Mask is a highly recommended product for acne-prone skin. It is very effective in fading blemishes and acne scars. And pocket-friendly as well. Do try it and share your experience in the comments below. Sound looks great one. Thanks for the review.